It's not often you get to see history made in front of your very eyes, however, that is exactly what I witnessed yesterday during the protests here in Thessaloniki that saw the cancellation of the city's annual military parade and forced the president of Greece to flee the area along with the country's defence minister. To those unfamiliar with the institution, 28th October is a national holiday in Greece and every year towns and neighbourhoods organise parades to honour those who fell while fighting an Italian invasion in 1940. The celebration is known as No day after the refusal by Athens to allow Mussolini's army to enter Greek territory and is a day loaded with signifigance for many Greeks, akin to Remembrance Day in terms of the hold it has on the national consciousness so the fact that the parade was abandoned and those present refused to let the army march is an unprecedent event. It's almost as if bystanders flooded Whitehall during Remembrance Sunday and forced David Cameron and the rest of the cabinet to flee. 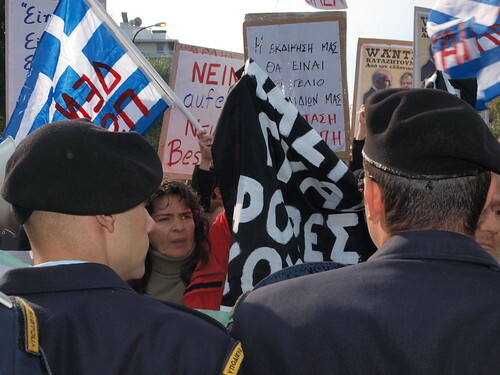 While over the last few years people have started to use 28th October events to air grievances the numbers have been small and many other Greeks have found such incidents an insult to the memory of the war dead. All that changed yesterday to surprise and amazement of most involved. For the country's political leadership it signalled the end of an era when they could command the loyalty (sometimes grudgingly given) of their electorate and showed them definitively that they are no longer welcome in any sphere of public life. Also for those who organised protests the reaction of the crowds took them by surprise, none expected that ordinary people would react in this way and close down the parade, many of them wandered round with huge smiles on their faces looking somewhat dazed, like kids who've been told in June that Christmas Day has been moved up to today. The police also were caught on the hop, unsure of how to deal with mass of people that included pensioners, small kids as well as political activists and unruly football fans. 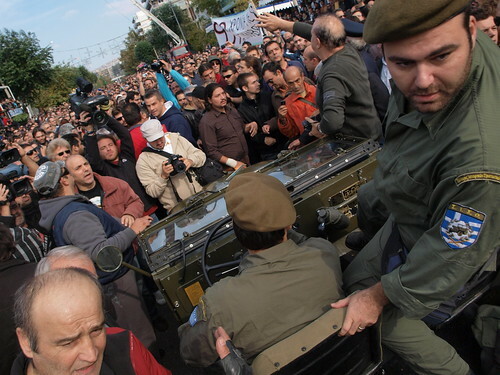 Despite being given orders to disperse the crowd by the minister of defence Panagiotis Beglitis, local commanders kept their response low key, realising the use of tear gas and percussion grenades (the usual police respone to mass unrest) could have catastrophic results in such a tense situation. Instead they allowed the protesters through police lines so they could continue their own people's parade that cheered on all non-military units that marched through. There were some clashes when army reservists taking part in the military parade tried to force their way through leading to fist fights with protesting football fans who lashed back (see video below). Thankfully, cooler heads prevailed on both sides and no one was seriously injured. When I got on the internet I saw that similiar protests were taking place across the country, even in small towns not noted for their radicalism, in most places the presence of politicians acted as trigger for people to boo, jeer and throw objects.In many cases mayors and MPs had to be hustled away under heavy police guard lest locals let their anger get the better of them. On the other hand the mainstream Greek media was mixed in its response to the day's events, TV channels such as Skai, Mega and Star filled their screens with indignant politicians and commentators who accused those involved in the protests from being everything from fascist dupes to mindless hooligans.Yet even with this heavy handed orwellian spin doctoring the images that showed town after town demonstrating and the street of Thessaloniki teeming with protesters clashed with the official line which claimed that all of this was the work of a few hundred political malcontents. It is a sign of how hunkered down the country's political leaders are that they have started believing their own propaganda about protesters being a small group of malavolent trouble makers being used by dark (and always unnamed political forces). On the other hand the sheer scale of the demonstrations has finally woken some up to the fact that that they are loathed and dispised by people from across the political spectrum. For the more conservative elements Papandreou's acceptance of foreign oversight is nothing less than treason, for those on the left the government has failed to protect the poor and the vulnerable and is happily dismantling what passes for a welfare state in Greece. 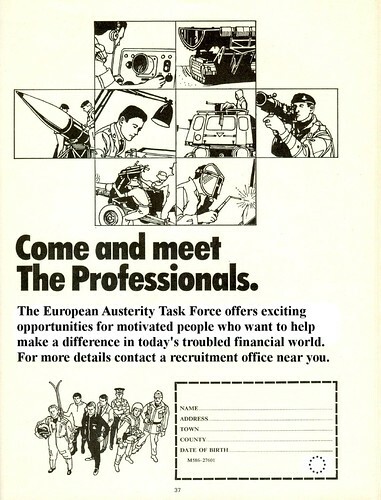 For nearly everyone the latest austerity measures have hit them hard coming as they do at a time of falling incomes, rising prices and skyrocketing unemployment. The writing is on the wall for the current political system as it is incapable of producing a credible alternative to the present set up and in such a situation the vacuum that will be created by the fall of the government may lead to turmoil and conflict as groups united only in their common hatred of PASOK clash with each other. Greek protesters close down military parade during anti - government protest, a photo by Teacher Dude's BBQ on Flickr. Greek health system's revolutionary new payment plan, a photo by Teacher Dude's BBQ on Flickr. 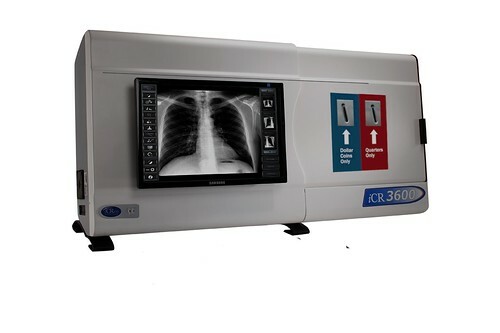 For just 1 euro you can enjoy 15 minutes of uninterrupted life support or 30 minutes of kidney dialysis." Satire aside, read the Lancet's take on the real crisis in Greek health care here. In Athens , Thessaloniki and many other towns and cities acros Greece hundreds of thouands took part in anti - government demonstrations aimed at over turning the latest round of austerity measures which promise to finish off what is left of the economy. 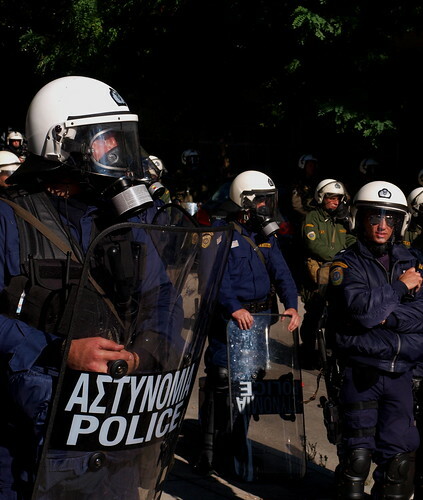 Greek riot police protecting government building, a photo by Teacher Dude's BBQ on Flickr. Yesterday between 60 and 80,000 took part in massive anti-austerity protests ahead of a crucual parliamentary vote on laws that will push by employment legislation by decades and cut wages and pensions yet again. There were extensive clashes between riot police and protesters towards the end of the march as it approached government buildings. Several molotov cocktails were thrown and police made use of tear gas and percussion grenades to break up demonstrations. 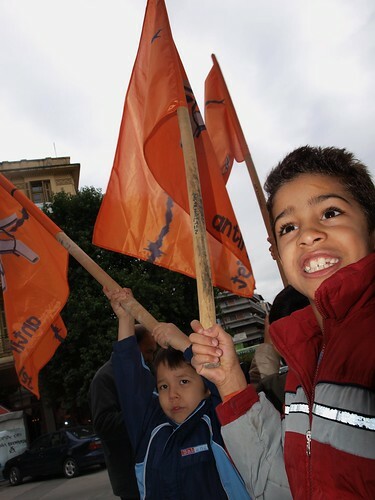 Euro zone pushing for tougher policing of Greece, a photo by Teacher Dude's BBQ on Flickr. Greek pensioner scavaging from rubbish piling up in the streets of Thessaloniki, a photo by Teacher Dude's BBQ on Flickr. Every cloud has a silver lining, Ever since the government decided to go head to head with the country's rubbish collectors refuse has been piling up in the streets, providing rich picking for pensioners and other reduced to scavaging through dumpsters to survive. Yet another achievement that Greek prime minister, Giorgos Papandreou believes that the Greeks should take pride in. 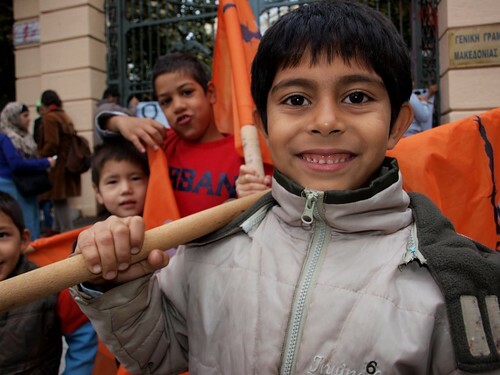 Young refugee kid soon to be evicted from Thessaloniki Refugee Reception Centre, Greece, a photo by Teacher Dude's BBQ on Flickr. For over 20 months Greece's second largest city has been threatening to close down town's only refugee reception centre. For 20 months the 15 families in residence have survived due to the efforts of local volunteer groups who have been paying for the centre's bills and the families food supply. The Greek ministry of health and the local Thessaloniki city council have refused to support the enterprise even though it was set up by them to deal with Greece's refugee crisis. However, even that indifference as been replaced by active attempts by the local authorities to evict the familes with no thought given to the future of those people. With the Greek economy in dire straits and the .local police department stepping up harassment of immigrants those inside the reception centre face the prospect of being kicked out into the streets and then with no permanent address, deported. The residents along with local supporters decided to stage a small protest march fromthe centre to the local ministry building, a move which threw thr riot squad protecting it into action. Immediately the central gates were closed and police took up position in case the eight year olds present made an attmept to topple the government. As a result negotiations between the officers in charge and representative who wanted to present their case to the local politicans had to be conducted through the bars ofthe padlocked gate. Young refugee kids soon to be evicted from Thessaloniki Refugee Reception Centre, Greece, a photo by Teacher Dude's BBQ on Flickr. For over 20 months Greece's second largest city has been threatening to close down town's only refugee reception centre. For 20 months the 15 families in residence have survived due to the efforts of local volunteer grouops who have been paying for the centre's bills and the families food supply. The Greek ministry of health and the local Thessalonikicity council have refused to support the enterprise even though it was set up by them to deal with Greece's refugee crisis. However, even that indifference as been replaced by active attempts by the local authorities to evict the familes with no thought given to the future of those people. With the Greek economy in dire straits and the .local police department stepping up harassment of immigrants those inside the reception centre face the prospect of being kicked out into the streets. 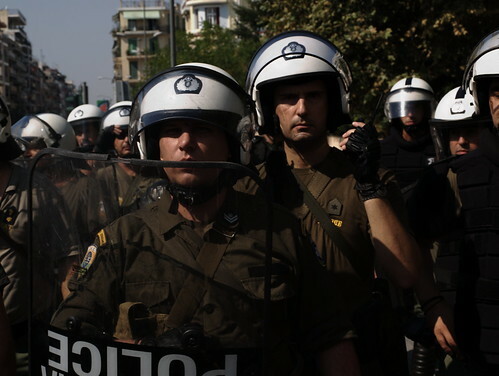 Last month 10,000 police officer were on the streets in order to protect the Greek prime minister who addressed the nation during the opening of the annual Thessaloniki Trade Fair. 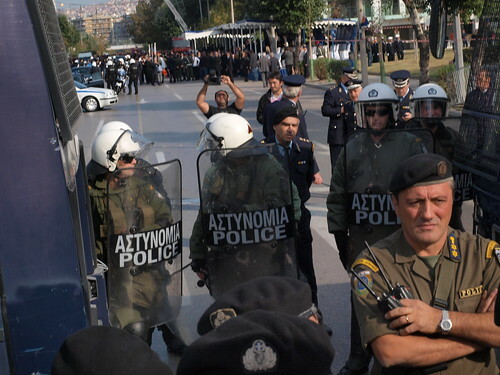 While Giorgos Papandreou announced yet more austerity measures the riot police battled with demonstrators for hours once more turning a Greek city into a warzone. Yet despite some of the most intense violence the city city has seen since the December 2008 riots which followed the murder of a 15 year old teenager by police in Athens the Greek media mainly ignored the scenes and instead concentrated on the prime minister's speech. Like the politicians they cover Greek journalists live in their own alternative universe where the major scandals go uncovered yet government press statments are repeated ad nauseum. 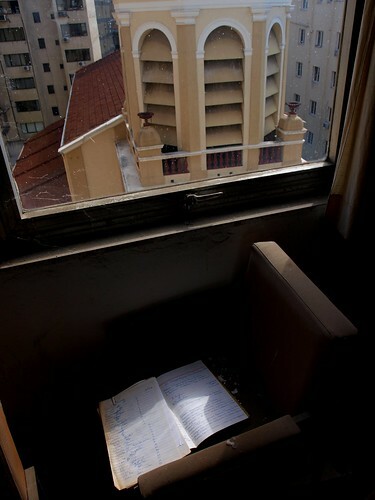 Dead hospital - Thessaloniki, Greece, a photo by Teacher Dude's BBQ on Flickr. This used to be the central St Paul (Agios Pavlos) hospital in the centre of Thessaloniki, Closed down years ago it as recently been taken over by activits in order to give shelter to the city's growing number of homeless. As more and more people are driven out of work and out of the country's health system the idea of a dead hospital is a pretty good allegory of the situtation in Greece. 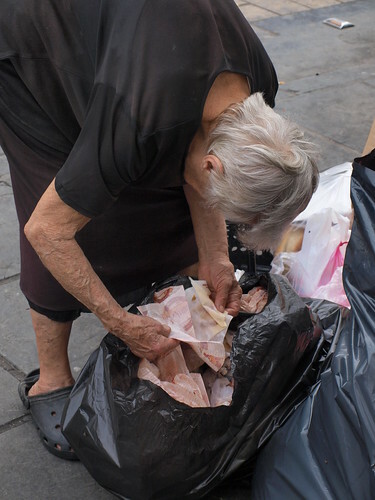 Greek pensioner looking through rubbish for leftover food, a photo by Teacher Dude's BBQ on Flickr. Greek pensioner going through the garbage outside the central open air market in Thessaloniki looking for leftover baked goods. Things have so bad here that many of my friends have stoppd listening to the news, they are sick of hearing about yet more job cuts and tax rises and the constant stream of hyperbole and hysteria that Greek media thinks passes for news. Euroman, the EU's newly minted banking superhero goes into action, a photo by Teacher Dude's BBQ on Flickr. 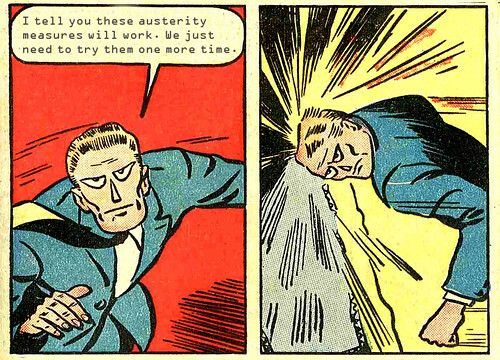 "I tell you these austerity measues will work. We just need to try them one more times." Worried about economic meltdown? 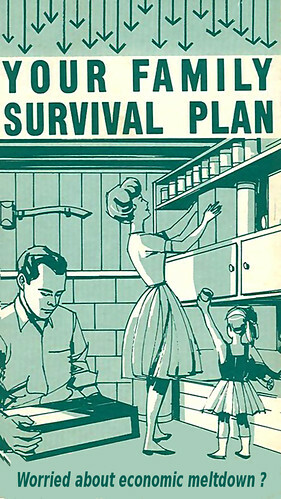 Your family survival plan, a photo by Teacher Dude's BBQ on Flickr. 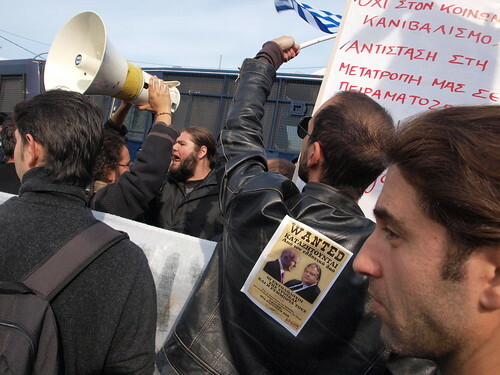 Reporters Without Borders issue alarm over police violence against reporters in Greece, a photo by Teacher Dude's BBQ on Flickr. Following a series of attacks on photographers and other journalists covering anti-government protests in Athens, Reporters without Borders has issued an alarm over the Greek police's treatment of reporters. Below is an extract from their damning report on lack of press freedom in the country. "Working conditions during demonstrations are nowadays rather like in a war-zone, which is both surprising and deplorable in an EU member-state. press photographers and camera-operators are by far the worst affected. Few protesters make a distinction any longer between media owners and journalists just trying to do a job. Photojournalists and camera-operators are scapegoats for all the bitterness and violence. to the police, they are undesirable witnesses of often harsh and illegal repression. “Our images show that the police don’t know how to do their job,” says Aristotelis Messinis, a photographer in Athens for the french agence France-Presse news agency. “We show up their poor training and their abuses and excesses. The police also consider the pictures taken of them as an invasion of their privacy. It’s weird but true. For activists and extremists, we’re a similar problem, as undesirable witnesses of their activities that don’t belong in such demonstrations. To them, the media is an arm of the government, so they attack us." 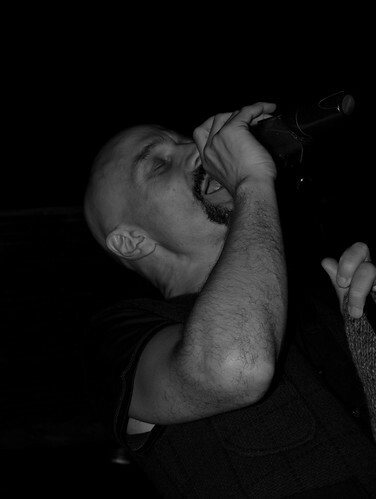 Tim Booth, front man for the UK band James playing at impromptu open air gig in Thessaloniki, Greece, a photo by Teacher Dude's BBQ on Flickr. I read about the gig on Twitter but thought that most likely the whole thing was a practical joke, but when I got to the White Tower I saw Tom Booth and the rest of the band rounding up people for an impromptu gig in a cafe opposite. Really great atmosphere, like having James play in your back garden for you and your friends.